CALE Now! provides youth with guidance and tools that will broaden their global perspective through international cultural experiences, and create global visionaries and leaders who will have a positive impact on the world economy, and who respect and comfortably operate within global constructs. The primary purpose of this organization is to provide meaningful growth experiences and personal development to young people who have limited access to international travel opportunities and cultural experiences, and facilitate lasting global connections that have a positive impact on future generations. This organization will provide guidance and tools to broaden their global perspective through international cultural, arts, and leadership experiences. The CALE Now! 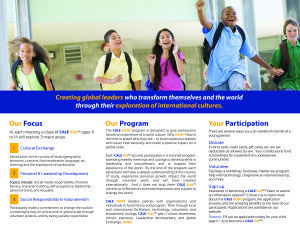 program is designed to give participants hands-on experience of a world culture. Why NOW? Now is the time to shape who they are – to build conscious leaders who travel internationally and make a positive impact on a global scale. Each CALE Kid™ actively participates in a summer program, attending weekly meetings and outings to develop skills in leadership and volunteerism, and to expand their experience of the world. By the end of the program, each participant will have a deeper understanding of the country of study, experience personal growth, and impact the world through volunteer work. And it does not stop there. 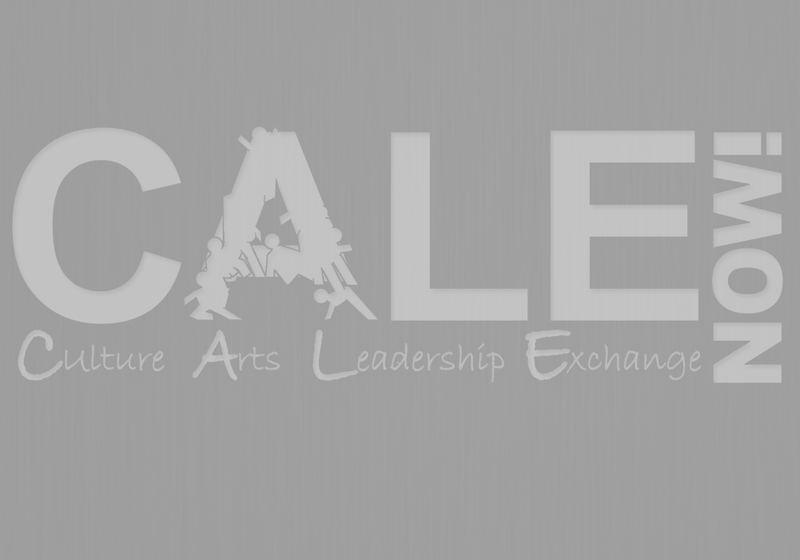 CALE Kids™ commit to a lifetime of continued exploration and a quest to change the world. CALE NOW! leaders partner with organizations and individuals to fund the trip and program. 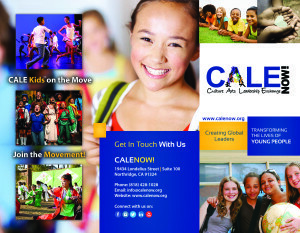 Then through local and international facilitators, technology, volunteers, and educational outings, CALE Kids™ gain Cultural awareness, Artistic exposure, Leadership development, and global Exchange…NOW! Parents and students are invited to attend an information session to learn about the CALE movement and its long-term benefits to the lives of participants, and to learn about the application process. Contact us for more information. CALE Now! was incorporated in 2012. On June 7, 2014, our first class of CALE Kids began their 8-week summer program, during which they studied social responsibility, personal and leadership development, and culture, then traveled to Peru. In July 2014 we were certified as a 501(c)(3) organization. CALE Now! is a movement that will transform the lives of young people through a program that incorporates innovative methods to teach them about the world and how they can impact it. 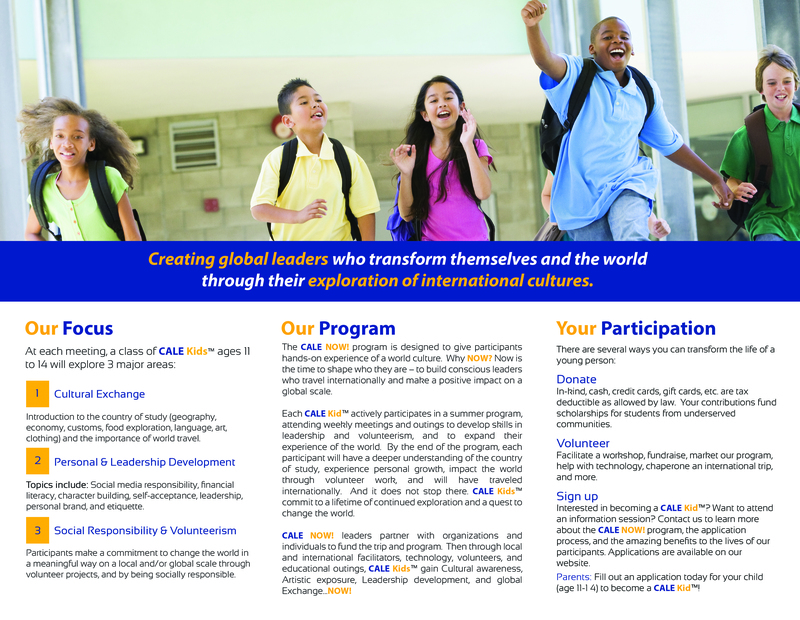 CALE Kids will participate in a summer program, through which they will study a particular country, experience personal development, volunteer, and at the end, travel to the country of study.